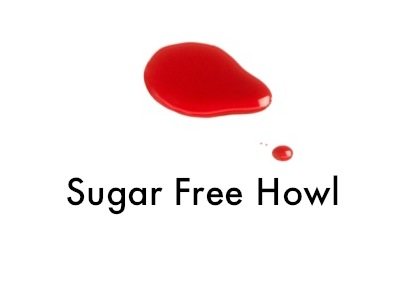 Sugar Free Howl : 90 days. I celebrated 90 days of sobriety this week. Well, "celebrated" is an exaggeration. I woke up too late in the day, around the time when young moms start texting each other for happy hour plans or when dad swears all the way home from work because he forgot about summer onramp closures. I have lost touch with the inability to be grateful. I gave up alcohol but took back nicotine and caffeine in exchange. I'm not sure I'll get to a place in life where I'll be without vices. Escaping bureaucracy has become less of a habit and more of a frustrating part-time job. I can only do one thing per day: make one phone call, pay a bill, text a sober friend. The thought of doing anything more wears me out. My skin has worn thin and everything hurts. The other day I woke up in the afternoon and cried first thing because I keep dreaming I'm being chased and drinking things I never drank, even when I was in the thick of my drinking. I keep telling people my allergies are really bad when really I was crying in my car and trying to pull it together to the point where others can see me as a real person. I'm really trying to buck up, but not having the energy to reach said levels of "up" has become really difficult. In the last two weeks, I've knocked out four seasons of Law and Order: SVU. A lot of my dinners have come from fast food locations or Super America, and I've eaten so much cereal that my body is starting to reject it. Despite being emotionally comatose, I've actually started taking better care of myself. My blood sugars are stable almost 100% of the time, and I floss every night. I have a cup of tea before bed and try not to wake my roommate while I light the stove at 2am. Kitty has kept me company through everything, the worst and the slightly worse. I have him, but I'm all he has. It's warm enough now during the days where I can leave a window open for him to peek out at squirrels or skateboarders. He's been pretty clingy since I got home from inpatient. He's usually sleeping in my side or in the bend of my leg. I think he knows something's going on with mom, but he isn't sure how to address it except for making sure I'm not alone, and that's all I really need. I've slowly become over-analytical of my emotions. Why am I feeling this way? What feeling is this? Do others think I feel differently? What can I gain from feeling like this? Is this emotion right or wrong? How can I express how I'm feeling without being aggressive or sarcastic? Use "I" statements. Be clear without applying swearing for emphasis. Such and such. I wear myself out from this emotional analysis. A few people have asked me if I'll ever be able to have a beer in the future, and I always reply with the same response: no. If there is one thing I can't do, it's drink responsibly. Things got so bad, and if I go back to drinking I know they'll get even worse than that, which is hard to imagine. I'm trying to rekindle my interest in things I used to love: reading, walking, spending time outside when the weather permits, learning, having fun in the loosest sense of the word. I'm distracted by outside influences, mostly the onslaught of feelings pouring out from an unknown emotional crevice. I feel like that random girl in Mean Girls who shows up to share her emotions on stage during the assembly. She doesn't even go there. In bed is where I feel the safest. Nothing can hurt me, and I have control of my own environment. Despite not having a door to my actual room, I feel like I've placed a decent sized wall between me and the outside. I don't like being awake, and when I'm sleeping my dreams catch up to me. I can't decide which nightmare is more frightening: the life that I want to subdue or the sleep that spirals down and down and down. Yet my bed is my cradle, my home: the 7 x 4' sanctuary of jersey sheets and cat hair. Nothing can bother me in bed, yet everything bothers me in bed. Rectangle limbo. I went back to reread this post and it's purely just thought garbage, sober thought garbage. But I'm trying to journal more and see a tangible portrayal of my feelings. It kind of helps, I guess. Now that I'm sober, most of my sentences end with "...I guess." I'm feeling okay, I guess. I should probably go to Target, I guess. I should write some jokes, I guess. I am the hollow egg and the bed is my carton. I am the sober egg, the somewhat grateful sober egg.